Going into Cloud Foundry Summit in Basel, Switzerland, there was anticipation about Kubo, the Kubernetes on BOSH project developed by Pivotal and Google. At the conference this week came the news of Kubo now being known as Cloud Foundry Container Runtime and its integration with what Cloud Foundry is calling its Application Runtime. Both runtimes run on BOSH, “the underlying open source tool for release engineering, deployment, lifecycle management, and monitoring of distributed systems” that serves as the foundation for Cloud Foundry’s platform. The shift to the new runtime discussion also changed the tenor of the conversation for the pancake breakfast The New Stack hosted, sponsored by VMware and held in conjunction with the Cloud Foundry Foundation. Pancake breakfast panelist Frederic Lardinois of TechCrunch said the news about the container runtime is another example that there’s no stopping the Kubernetes train. It is moving faster and faster. It is not just a mixture of different communities, but also different ways of managing software. What followed were discussions about Cloud Foundry’s strategy to build a story about ways it is fostering new workloads and working across communities. Abby Kearns, executive director of the Cloud Foundry Foundation, made the point that there is a whole host of cloud-native technologies that have uses for various types of workloads. The goal is to automate and abstract as much as possible. The opportunity is to support multiple workloads in different manners. And in the end, Cloud Foundry is providing more options for developers. “The way I think about it is developer choice,” said Mark Peek, vice president and principal engineer at VMware. But how will the developer experience really be affected? What does this mean for the clear value that Cloud Foundry has traditionally provided? These were just some of the questions that were discussed in this lively early morning discussion over pancakes in Basel, Switzerland. Cloud Foundry Foundation, Google and VMware are sponsors of The New Stack. 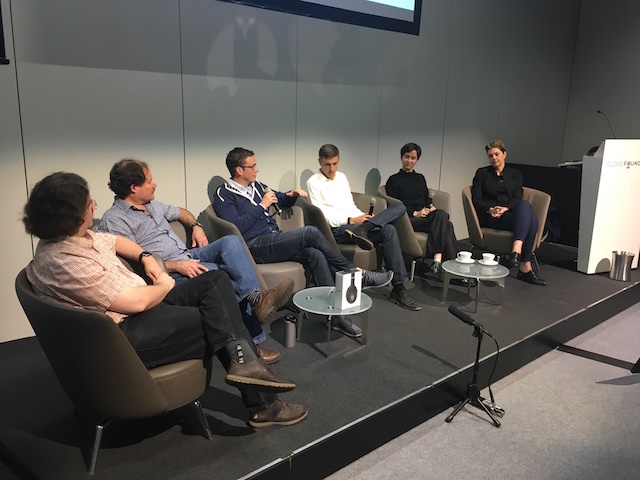 Feature image (left to right): Frederic Lardinois of TechCrunch, Mark Peek of VMware, Ian Andrews of Pivotal, Marco Hochstrasser of Swisscom, Sarah Novotny of Google, and Abby Kearns of the Cloud Foundry Foundation.